On the Friday 21st November 2014 the 2014 RMA Dundee dog auction and trial was held. 35 dogs were sold with a top price of $4450 paid for 'Culgoa Morton' a 3yr old black/tan kelpie dog who was sold by Sam Gates. Purchaser's Chris and Kelly Hoppe from Deepwater were impressed with Morton on his alround ability shown on the pre-sale youtube video. 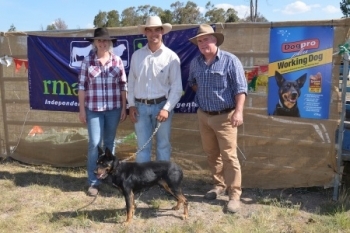 Since aquiring Morton, Kelly has had been wrapped with the way the dog has fitted into her everyday stockwork duties on their property running 500 Angus cows and a crossbred ewe operation.